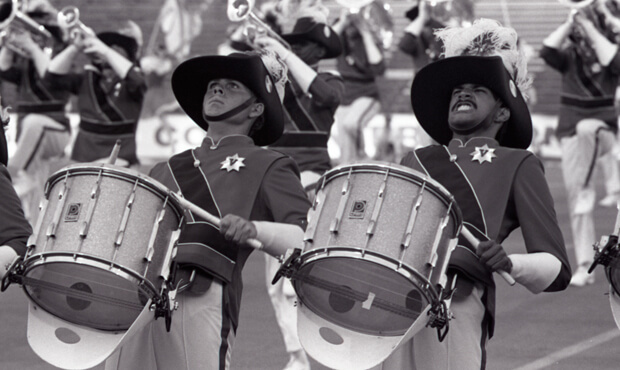 When the 1985 DCI World Championships went to the University of Wisconsin's Camp Randall Stadium for the first of seven times, the Garfield Cadets became the first World Class corps (then referred to as Open Class) to win three titles in a row. Also in 1985, after 10 straight years as a finalist corps, the 27th Lancers slipped out of the big show for good, replaced by the Troopers, who hadn't earned a spot among the "Top 12" since 1981. Also making the Finals competition was Bloomington's Star of Indiana in its first year of existence. 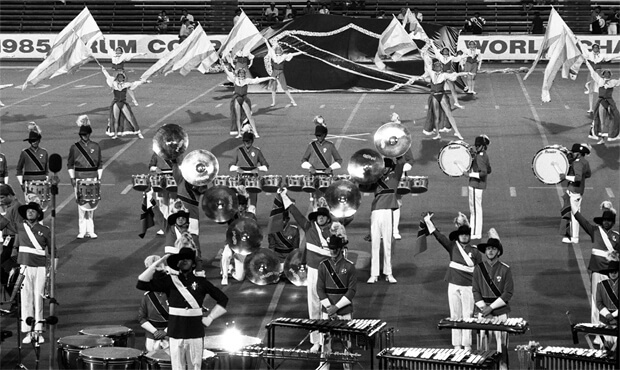 Santa Clara Vanguard placed second at the '85 Championships for the first of four consecutive years, opening with Dmitri Shostakovich's "Festive Overture." The piece was written in 1954 to commemorate the 37th anniversary of the 1917 October Bolshevik Revolution, the event that toppled Tsar Nicholas II and led to the establishment of Soviet Russia. Shostakovich wrote the work in just three days after he was contacted by the orchestra conductor of Moscow's Bolshoi Theatre, who needed a piece of music for the occasion. The grand fanfare to the overture started with the soprano buglers opening up a giant "X" formation on the 50-yard line, accompanied by the color guard members in long flowing skirts that were utilized like capes. They were colored forest green on the outside and red on the inside and soon removed to reveal shorter red skirts. The articulate features of the upper brass voices—treating the horns as percussively rhythmic instruments—were among the crispest witnessed in the 1980s. During a front ensemble percussion break, the soprano buglers all disappeared into a green, six-foot-long fabric tunnel, turned parallel to the front of the field so one couldn't see into it. The members were wearing white-striped green pants when they went in. But when the tunnel pivoted, the sopranos marched out wearing red-striped white pants. It was as if done by magic. During another percussion break, the remaining brass players, still wearing green pants, passed single file through the tunnel. Eight counts later, each member came out wearing white pants. The line of remaining horn players suddenly picked up the tempo and went through the tunnel at a much faster rate. In the video, you can plainly hear the audience react to that moment. Three Aaron Copland works finished off the show, starting with "Grovers Corners" from Copland's "Our Town." Copland wrote the piece for a 1940 film adaptation of the 1938 three-act play by Thornton Wilder, the famed writer who won three Pulitzer Prizes. The play tells the stories of typical Americans in a fictional early 1900s New Hampshire small town. The simply elegant and plaintive Americana musings of the quiet piece remain one of the most lovely and expressively haunting works ever put on the football field. Vanguard made the captivating strains even more mystical by accenting the music visually with huge flags of aqua blue, light lime green and white stripes with long, wispy white fringes. Copland originally wrote his only full-length opera, "The Tender Land," during 1952-1954 for a television opera workshop that didn't pan out. He was inspired to write the music to tell the story of an American farm family during the Great Depression. After a lukewarm reception at its later premiere with the New York City Opera, he arranged parts of the work into an orchestral suite in 1958. Vanguard played "Party Scene" from Act II of the work, an exuberant ditty highlighted by pink parasols and pastel flags. This segued into "The Promise of Living" from the end of Act I. In the opera, this is where three generations of the farm family members, along with their hired help, express a hymn of gratitude for their lives, the land that gives them sustenance, and a bountiful harvest. As Copland was fond of doing, he incorporated a piece of traditional American music into the work; in this case, the hymn, "Zion's Walls." The grand finale of the lovely chorale played by Santa Clara Vanguard ended with a huge climax that tailed off into silence. The third work by Copland utilized in this production was his six-movement orchestral suite, "The Red Pony." Copland arranged it from his music for a 1949 film based on John Steinbeck's 1933-1937 three-part magazine serialization of a story about family life on a California ranch. Santa Clara Vanguard played the movement titled "Happy Ending" which was originally the movie's opening music, then titled, "Morning on the Ranch." During this segment the color guard members ran through the tunnel and many came out wearing the long flowing skirts worn earlier in the show. As a final punctuation mark to end the production, the fabric of the tunnel was inverted to reveal Vanguard's logo of a forest green shield with a diagonal red sash. For this week only, you can save on the Legacy Collection DVD that contains this complete Santa Clara Vanguard performance, along with all finalists from the 1985 DCI World Championships. Discount DVD offer ends Monday, January 19, 2014.